Sarah Butler was commissioned by PublicWorks to write a new fiction for a stretch of the Leeds-Liverpool Canal which formed the focus of Liverpool Biennial’s 5 day conference, Urbanism 09. The magical story aimed to explore the potential of a place which is frequently dismissed as a ‘wasteland’. The story is called ‘Fishing For Stars’ (inspired by the star shaped lanterns attached to the ‘Club’). It follows three characters, Caib, Rhaw and Bywell (their names are drawn from a mural of ancient tools painted on one of the canal’s walls) who all discover their own routes into a magical parallel universe, where their wishes for the canal come true. 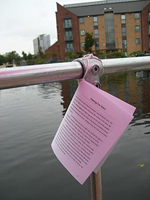 Vinyl-cut extracts from the story were installed onto the Canal Club itself, copies were hung by the seating areas, and visitors were given copies to take away. You can download fishing for stars here. 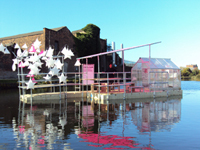 The Canal Club was a temporary structure, created by PublicWorks as a conversation space for local people to explore the possibilities for change in the area. 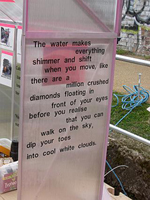 This entry was posted in Past Projects and tagged Liverpool Biennial, Public Works. Bookmark the permalink.